Yes, really. And this is one of the best dishes we’ve made in quite a while. We don’t say that lightly. We tend to post only recipes that we like a lot. But even by that standard, this dish is extraordinary. Best of all, kale and cabbage tend to be inexpensive this time of year. So you get tasty on a budget. Nice. A gratin is a casserole-like dish that is baked in a shallow vessel, with a top coat of buttered breadcrumbs or grated cheese (the top browns nicely as the dish bakes). Cooks often use cream and cheese to bind the ingredients together. Think scalloped potatoes—or the fancy French version thereof, Gratin Dauphinois. In this recipe, we use eggs instead of cream, then add cooked rice to the cheese to help bind everything. The ingredient quantities we specify are not meant to be exact, BTW, so don’t stress over measurements. As long as you’re in the ballpark, you’ll be good. We found this recipe in Martha Rose Shulman’s Mediterranean Harvest. It typifies the sort of dishes Shulman found in Provence when she lived in France. Shulman also contributes to the Recipes for Health series in The New York Times health section, where she publishes new recipes several times a week. She’s one of the best recipe developers we’ve encountered. Our version of this dish is very lightly adapted from hers. This recipe yields 4 (maybe 5) hearty main-course servings, or double that number if you’re using the dish as a starter or side. Leftovers keep for a few days in the refrigerator if stored in an airtight container. Peel the onion, then cut it into small dice. Set aside. Peel the garlic, then mince it finely. Set aside. Wash the kale and shake off the excess water (but do not dry). Strip the leaves from their stems. Chop the kale roughly. Set aside. Remove any blemished outer leaves from the cabbage head. Cut the cabbage in half and remove the core from one half (reserve the other cabbage half for another use). Roughly chop the cabbage into pieces of an inch or so. Set aside. Heat a large, heavy-bottom cooking pot, such as a Dutch oven, on medium heat. (Alternatively, you could use a large frying pan, but we find that a deep pot works better—see Notes). When hot, add olive oil. When the oil is heated (it’ll shimmer—this takes 15 seconds or so), add the diced onion. Add a few pinches of salt to season, then sauté the onion until it becomes translucent (5 to 8 minutes). Add the minced garlic and cook for 1 minute (but don’t let it brown). Add the red pepper flakes (if using) and cook for another 15 seconds. Then add the chopped kale. Add additional salt to taste (about ½ teaspoon Kosher salt—see Notes), then cook the kale until it begins to wilt (4 to 5 minutes). Add the chopped cabbage, the dried thyme, and additional salt to taste (a few pinches of Kosher salt for us; see Notes). Add black pepper to taste. Cook the mixture for another 10 minutes, stirring occasionally, until the cabbage is wilted. While the cabbage is cooking, beat the eggs in a bowl large enough to hold the contents of the Dutch oven. Wash and chop the parsley, then add it to the beaten eggs. Grate the cheeses. Add about half the grated cheese to the bowl, reserving the remainder (for the next step). Add the cooked rice, then mix everything together. Once the cabbage-kale combo has wilted, taste it and adjust the salt and pepper if necessary. Then add it to the bowl containing the egg-and-cheese mixture. Mix all ingredients together. Grease a 2-quart gratin dish (see Notes) with 2 to 3 teaspoons of oil. Pour the contents of the mixing bowl into the gratin dish, and spread them out. Top with the remaining grated cheese. Bake the mixture until the gratin is firm (start checking after 25 minutes—though baking usually takes 30 to 40 minutes). The cheeses should be brown when the gratin is done; if they’re not, run the gratin dish under the broiler for a minute or two to brown the top (note that if you do this, any bits of kale or cabbage that are poking up through the layer of cheese may char a bit; we like the flavor of this, but you may not). Serve the gratin either hot from the oven or cooled to room temperature. This dish looks nice with a garnish of parsley (although we sometimes don’t bother). If you don’t have cooked rice on hand and need to cook some for this recipe, we suggest starting the rice at the same time you preheat the oven (Step 1). One half cup of dry rice will yield enough for this recipe when cooked. A short-grain rice like arborio is ideal for this dish—its creamy texture blends well with the other ingredients. But any rice, including brown rice, will work OK.
You could use a 12-inch frying pan (preferably nonstick) for Steps 6 through 9. But we prefer to use a deep cooking pot, such as a Dutch oven. That’s because kale (which you add in Step 8) starts out voluminous. It cooks down in a few minutes, of course—but at the beginning it’s enough to overflow a frying pan, even a deep one. The quantities of cheese specified in this recipe are approximate; a bit more or less won’t matter much. If in doubt, measure by weight rather than volume (because volume can vary depending on how finely you grate the cheese). Although Gruyère is wonderful in this dish, you can substitute any Swiss-style cheese that melts well. We use Pecorino Romano in this dish because we like its assertive flavor, but Shulman specifies Parmigiano-Reggiano. Either works well. We like dried thyme in this dish (Shulman prefers fresh sage). But substitute any herb you like—fresh rosemary, for example, would be wonderful. How much salt and pepper to use? Suit your own taste. We add a few pinches of salt at several points while preparing this dish (see Procedure), along with some pepper. It’s best to start with less than you think is necessary. You’ll be tasting in Step 11 before adding the kale/cabbage combo to the egg mixture, so that’s the perfect time to adjust the final seasoning to your liking. BTW, the kale/cabbage combo is very tasty all by itself, even without adding the egg-and-cheese mixture (though it’s not as rich, of course). It makes a great side dish. We use a 2-quart gratin dish for this recipe. But any shallow baking vessel will work (use one that is about 1½ inches deep). You could try using a 2-quart pie dish, for example. Since the finished gratin is quite firm and easy to cut into slices, baking it in a pie dish would allow you to cut wedge-shaped slices when you serve. “And you’re an expert on cheesy,” said Mrs K R.
I prefer to say I’m a cheese whiz. This dish looks wonderful! Wish to have a little bit right now! I could eat this - probably for breakfast, lunch and dinner! It has received great praises so I'll have to give this a try - maybe with a few drops of hot sauce? Yummy! This look so good!!! Im always looking for new ways to eat kale....get bored of the usual roasted, sautéed and in soups. This is perfect because I love gratins, and cabbage. You read my mind John although, I am not muttering, I am actually questioning this combination out loud. What!?! Not a combination I would remotely consider. Gratins have a way of marrying combinations that one would not normally think to mix I think. The eggs in this one really sends it over the top. I can see why the author would use sage but thyme does it for me too. Hi Marcela, this dish really is wonderful! Wish we had some, too -- but all gone. :-) Thanks for the comment. Hi Tricia, a bit of hot sauce would be really good with this. In fact I added a bit for one iteration. ;-) Thanks for the comment. Hi Nazneen, this is a great way to use both kale and cabbage. You taste both of them, but together they form kind of a new flavor -- very interesting. Thanks for the comment. Hi Louise, this is one of those dishes that's been on my "list" to make for what seems like forever. People often have leftover cabbage at this time of the year (from their St. Pat's Day feast) so I thought the timing would be perfect. ;-) Thanks for the comment. John, this indeed is a **Provençal-style charmer** !! Wow, I now know what will be the focus of my weekend!! Thank you so much for this inspirational idea - I did not try kale in this particular combination of ingredients. So, I'm excited to do so. And thnak you for the reference to Martha's blog! I adore cabbage, so am thrilled with your two most recent recipes. And if the rest of the family isn't so gung ho, I'd happily savor every bite myself. This is a terrific way to feed the kids kale. Scrumptious, comforting. Cool dish John! Was really surprised to see this made with rice, making it even more appealing! Trying to cut back on those potatoes, so rice is a great alternative. You're right - cabbage and kale? Certainly wouldn't have come up with that but I trust you that it's a great combo. Also love seeing eggs used in place of cream. A fantastic meatless meal John. Thanks! Oh, yum.....I know this is delicious! How could it not be with all those flavors. Gruyere cheese is a great choice. Hi La Torontoise, isn't this a great dish? 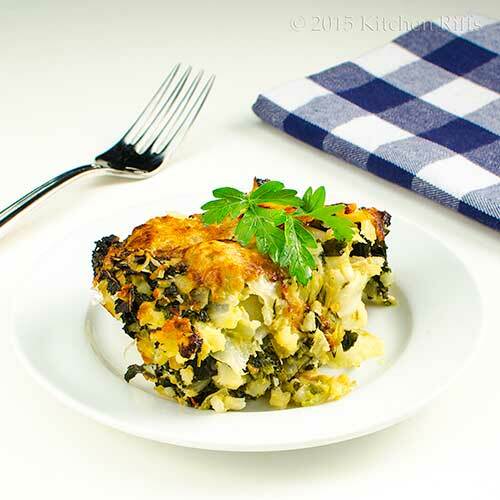 It isn't a combo of ingredients I'd have thought of, but kale and cabbage rock when paired! Thanks for the comment. Hi Liz, I'll bet the cabbage haters would like this -- really incredible flavor. IMO, of course. :-) Thanks for the comment. Hi Minnie, unless you tell them, a lot of people won't even know there's kale in this. Well, I guess they will have they've had several bites, but by that time they'll be loving it! Thanks for the comment. Hi MJ, this really is a great dish -- definitely worth a try, IMO. Be fun to use New Mexican flavors in this dish. Thanks for the comment. Hi Pat, hard to resist cheesy toppings, isn't it? This really is a nice dish -- loaded with flavor. Thanks for the comment. This sounds delish John. I love Provençal type food. The fennel and tomato also excellent - totally yum. Hi Nee, thyme is great, isn't it? And I guess neither is ever that expensive, but they both seem to go on sale at this time of the year (something about St. Pat's and cabbage!). Thanks for the comment. Hi Madonna, Provence really has such nice food, doesn't it? This is a super dish (as is the fennel and tomato gratin). Thanks for the comment. This looks so good! I love gratins -- they are so comforting and loaded with cheese. It is always refreshing to see one without potatoes. I love gratins! Simple, tasty, and very hearty. I love your recipe but, I was wondering instead of Kale, I would love to use spinach, would that work? I think so but my family including myself are not fans of Kale, that is why most of the time I sub spinach. Love the rice, cabbage, eggs, spices, and of course the cheese. I love Thyme and Sage, so I guess I will have to make it twice to see which I like better. I will have to check on Martha Rose Shulman’s cookbooks. Thanks for your lovely dish and it is a perfect time to prepare this. Have a beautiful rest of the week John. Hi Denise, potato gratins are awfully good, but there's a whole world of gratins beyond potato ones! Thanks for the comment. Hi Dottie, I'd definitely give spinach a shot! Haven't done it, but it sounds good. Spinach wilts pretty quickly, though, so I'd first cook the cabbage, then add the spinach for a couple of minutes at the end. Thanks for the comment. Hi Greg, not vintage -- it's one of Le Creuset's models (one of their classic styles). I assume they still make this model -- we've had ours for maybe 20 years. I have some old Le Creuset bright yellow (almost a ballpark mustard) cast iron stuff that is pretty scratched up, but still love the color! Thanks for the comment. Hi Gigi, baked (roast) cabbage is wonderful, isn't it? And this dish is even better. IMO, of course. :-) Thanks for the comment. This makes perfect sense to me, one of my favorite gratins is made with Brussels sprouts. I love that this is an authentic Provencal recipe, I'm going to give it a try this week, thanks John! I am a big fan of cabbage. So I am thinking that I would enjoy this gratin. Beautiful dish. I think you guys could write a cookbook on gratins! LOVE this one because I LOVE cabbage. No one else in my family might eat this because of the cabbage, which is a great thing in this case. Thanks for a wonderful recipe. Hi Sue, Brussels sprouts! We need to do that! ;-) Thanks for the comment. Hi Charlie, yeah, not a gym person. Pushups at home? Sure -- don't like them, but I'll do them. And planks -- yuk! Gotta do them, though. :-( Thanks for the comment. Hi Zoe, not a common combo, but uncommonly good. ;-) Thanks for the comment. Hi Dawn, any cabbage lover would really like this, I think. We do! ;-) Thanks for the comment. Hi Ansh, more for you if you make this! Truly worth a try sometime. ;-) Thanks for the comment. I love greens in a comfort food recipe! So many healthy ingredients in this dish. I am a huge fan of cabbage! Hi John, I love this dish, gratins are my favorite. This could be my entire meal. Ahh, wish I were back in France. I can picture myself eating this dish, sitting on a porch in a Provencal villa (or not!) I see that your blue-checked napkin got replaced in the first photo! This wouldn't normally be a recipe I'd be tempted to try, but with your high praise I will! Of course, cheese takes everything over the top - over the upper crust, perhaps? 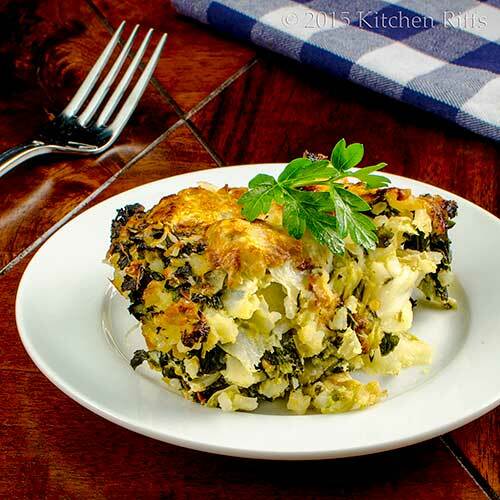 Hi Julia, greens work great in gratins -- lovely flavor and they add a spot of color. Thanks for the comment. Hi Cheri, it was our entire meal when we made it! Then had it again the next day. ;-) Thanks for the comment. Hi Fran, LOL re napkin. That's become kind of a fun watermark for me. Needed something different in that first photo, though. ;-) Thanks for the comment. Hi Beth, the kale/cabbage combo sounds weird, I know, but it's really good in this dish. I don't think you'll be sorry -- after all, it's an upper-crust dish! :-) Thanks for the comment. Hi Judy, this gratin is really good. When I first read the recipe I thought it'd be good, but I was a bit dubious -- it took me years to get around to making it. Really glad I did! Thanks for the comment. Forget the muttering--this sounded great the moment I saw the title! I love vegetable and gratin anything, really. And isn't it a great feeling when you find that new best dish? Hi Rocquie, you'll enjoy this -- it's really good. :-) Thanks for the comment. Hi Ala, always fun to find a spectacular new dish. And this is one. :-) Thanks for the comment. I just bought a cabbage you are correct---cheap. I will get some kale and try this out. I'm always looking for a new way to prepare kale - it's one of my favorite vegetables! Hi Carol, this really is a winner. A charmer, you might say. :-) Thanks for the comment. Hi Laura, this is such a nice way to use kale! Bet you'll like it! Thanks for the comment. Adding cheese and breadcrumbs to any vegetable gets my vote. I love gratins and a kale and cabbage one definitely gets my interest. I've really got to try this one. Great post, John! I've been looking at winter recipes as it's going to be cool-ish soon. (winter means wearing shoes). This gratin sounds like it should be on my winter must-make list. I love gratin but it's the first time I've heard of kale and cabbage in gratin. I'd have to try this. Hi Bill, pretty hard to say no to cheese, isn't it? Love gratins for that reason! Thanks for the comment. Hi Maureen, this is a good recipe for when you have to wear shoes. ;-) Thanks for the comment. Hi Peachy, kale and cabbage is a pretty unusual combo. But good! Thanks for the comment. Good to see that kale is still the "It'' veg in your house. I know I still love it, despite its over-popularity. With cheese? It's even better. This looks like a perfect dish to enjoy most any time of day. Hi Carolyn, yup, we're still rocking plenty of kale! Treat it right and it'll treat you right. ;-) Thanks for the comment. Putting vegetables in a gratin is ALWAYS a win! :-) I like the idea of mixing kale with cabbage - a tasty combination! Hi Juliana, at least in this dish it's an amazing combo! I was surprised, too. Thanks for the comment. Hi Amy, veggies and gratins just suit each other, don't they? And this one certainly suits me! Thanks for the comment. What a great side dish! It looks and sounds wonderful. kale and cabbage? totally can see them working in a gratin: sturdy and flavorful and awesome when roasted (and, cheese!) I made your easy roasted cabbage for st. patricks' day here, and it was amazing: so easy (yay) and also was perfect for the rather chilly evening. thank you! Hi Debra, the flavor of the kale really shines in this dish, as does that of the cabbage. Really good stuff! Thanks for the comment. Hi Pam, it's a fun -- and delish! -- dish. ;-) Thanks for the comment. Hi Shannon, isn't that roast cabbage good? I'll bet you could use leftovers (leftovers? Hah!) in this dish. And this dish is definitely one worth trying. ;-) Thanks for the comment (and for letting us know you enjoyed the roast cabbage). Hi Amira, if you don't like the kale,cabbage combo, this probably isn't for you! They all can't be winners for all of us. :-) Thanks for the comment. Haven't made gratin in a long long time. You just gave a great idea with all the veggies. We in fact love both the veggies, this is going to happen soon. Hi Asha, this really is a winner, at least for us. You too, I'll bet. :-) Thanks for the comment. I am in the same boat as Asha. Haven't made gratin since ages. This one looks great and I hope I could make some for dinner tonight. Thanks for sharing. Hi Taruna, high time you make a gratin again, I'd say. ;-) This really is good stuff -- worth trying sometime when you're in the mood. Thanks for the comment. Hello John, we all need a delicious rustic gratin dishes in our stash for meatless Mondays and anytime you just want a bite of deliciousness. I have actually been having more meatless meals as just the expense of groceries with 2 growing teenagers in Asia is much more that I anticipated. Thanks so much for this recipe. Thanks so much for our extended conversations regarding photography. I have decided to start my venture in a smaller goals. I have a Canon with software to shoot with wireless remote control and have just worked on getting that sorted this weekend. Shooting tethered without the tether...You have to love that! It would be so much nicer just to see my photos on the bigger screen to see if I have all the shots needed. Next will try to investigate the Canon software for photo adjustments for raw photos. Baby steps as it does take time to get used to all of these items. damn delicious n healthy gratin!!!! Hi Bam, isn't this a nice recipe? Your boys will love it! Good idea to use the Canon software. I don't have experience with it, but understand it's pretty good. Have fun playing! And thanks for the comment. Hi Dediy, it is indeed damn delicious! Thanks for the comment. I love combinations of ingredients people wouldn't expect. Kale and cabbage are completely affordable and definitely healthy. Right up my alley! I love it when recipes I don't really expect to be that good, turn out great. What a fun combination! What an unlikely combination, so intriguing! I want to try some!! What a hearty casserole! kale and cabbage combination sounds interesting at the beginning, but I think they would go well together. Hi Kristi, this is really nice! Totally tasty -- we're having this again, soon. ;-) Thanks for the comment. Hi Chris, isn't this nice? Really excellent combo of flavors -- I wouldn't have guessed until I made it! Thanks for the comment. Hi Kristi, you'll like it -- it can easily serve as an entire meal! My kind of dish. ;-) Thanks for the comment. Hi Holly, cabbage and kale really do work together. Not a combo I would have thought of, though! Thanks for the comment. Hi Kumar, greens in gratins are so nice, aren't they? And this is a good dish! Thanks for the comment. A homely creation! Kale, cabbage and cheese gratin just sound in harmony. Love this dish!! I love Martha Rose Shulman’s recipes! This one looks like a keeper. The mix of kale and cabbage is a great use for my CSA veggies right now. Hi Julie & Alesah, this is indeed a harmonious dish. :-) Thanks for the comment. Hi Lisa, aren't her recipes wonderful? Never met a bad one. And this really is a keeper --- awfully good! Thanks for the comment. How do you always know exactly what I what to eat before I do? I adore kale and cabbage - but never have had the two together - in one dish - with cheese and rice! What a fantastic gratin! Thanks for sharing Martha Rose Shulman’s recipe! Thanks for the recipe, another way to make use of Kale. Love this. Hi Candy, this is definitely a delish dish -- bet you'd enjoy it. ;-) Thanks for the comment. Hi Shashi, isn't this great? It's going to be a regular at our house! Thanks for the comment. Hi Raymund, this is one of the best kale recipes I know -- really good. ;-) Thanks for the comment. With an opening like that I know this must be a winner. Can't wait to try this! Maybe this will be one way to get Manservant to eat his kale! I did wonder about kale and cabbage in a gratin but all that cheese convinced me. Hi Abbe, this really is a winner -- loads of flavor. All of it good. :D I'll bet Manservant will really like this! Thanks for the comment. Hi Suzanne, cheese makes almost anything good! But actually, the kale and cabbage mixture is really good even without the cheese. Good stuff. ;-) Thanks for the comment. 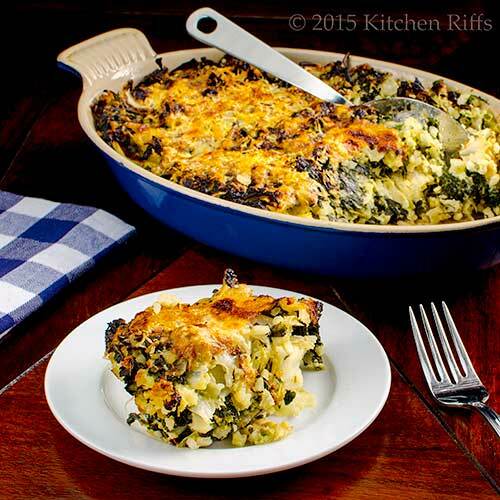 You have combined all the good stuff into this gratin, Kale & Cabbage!! Thanks for sharing this wonderful recipe! Hi Shibi, there really is a lot of good stuff in this dish, isn't there? Tons of flavor. ;-) Thanks for the comment. What a great recipe, I love the idea of cabbage and kale. Tell me, does baking the cabbage stink up the house? Last year I made a version of your celery root potato gratin and it was lovely, I may do this for Easter this year. Have you tried it without the rice? Trying to cut down the carbs. Hi Eva, I haven't tried this without the rice, although there isn't that much in the dish. But every bit counts, I know! Could probably add another egg and more cheese to the dish and you wouldn't miss the rice (although I like the way it looks). And about the cabbage stinking up the house when roasting/baking? No -- although I baked it at a fairly low temperature (350F) for roasting. I haven't tried it at a higher temperature -- I'm guess you'd get a bit of aroma if you did that. Anyway, thanks for the comment. Funny, but you said kale and cabbage gratin and I thought - this is what the French eat! I was right! I adore this kind of combination of "poor man's" vegetables (very French) and turned into a gratin. We would definitely eat this as a main course. In fact, I might just do that! Hi Jamie, this really is a good combo, isn't it? We like it so much, we're having it again tonight! Thanks for the comment. Gratin is the best way to eat vegetables in my eyes! Love the kale and cabbage version. Hi Amanda, this is really a good dish. Had it again this weekend -- so nice! Thanks for the comment. I know your recipes are superb, but when you said this is on top of the list, I must try this out! 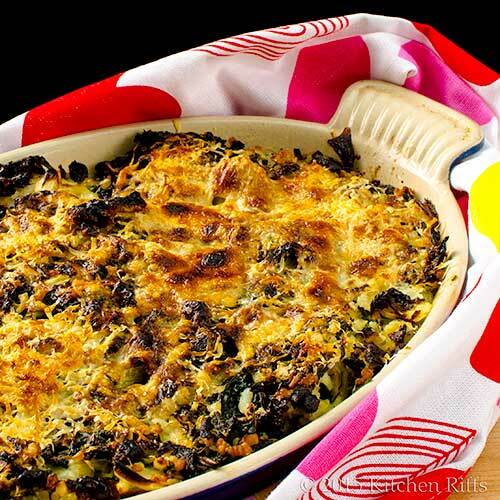 I LOVE both cabbage and kale (love vegetables in general) and this gratin sounds so good!!! Got everything in the kitchen. I might need to buy additional kale, but plan to make it this week! Looks so good! My vegetable loving kids will enjoy this too!! Hi Nami, this really is a wonderful dish. We served it over the weekend to some guest , and had finished the leftovers for dinner tonight. Really a good dish -- we've been making it often. Thanks for the comment. Hi Marcelle, it really is a terrific dish! One we've made often. ;-) Thanks for the comment.